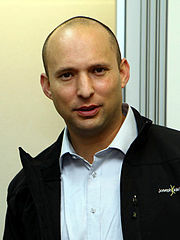 Naftali Bennett – the future of Israeli politics? There is a new star on the horizon of the Israeli political landscape. His name is Naftali Bennett and he represents the new ultra-right that is dissatisfied with all attempts to placate the Palestinians and those internationals who oppose his vision of the future Israel. The snippet below is from a long interview published in The New Yorker and it gives us a fairly comprehensive and chilling picture of the man. Is this the future of Israeli politics. If so, Naftali Bennett is surely the harbinger of death! “I will do everything in my power to make sure they never get a state,” he says of the Palestinians. No more negotiations, “no more illusions.” Let them eat crème brûlée. Tags: israel and palestine, israel and palestine conflict, new star. Filed under Israel and Palestine, israel and palestine articles, israel and palestine conflict, map of israel and palestine by Father Dave on Jan 19th, 2013. Comment. It seems that Netanyahu runs the risk of winning the battle but losing the war! While the Israeli PM’s violent attack on Gaza and his announcement of new settlement activity in the West Bank may be ensuring him victory at the upcoming Israeli election, the rest of the world seems to be increasingly isolating Israel and putting their weight (and their money) behind the Palestinians! Earlier this week the UAE donated $50 million to Gaza! At the same time the European Union accelerated their timetable for delivery of aid to the West Bank. And now, as you’ll see in the article reprinted below, Saudi Arabia has chimed in with another $100 million for the Palestinian Authority! Meanwhile, according to some commentators in the US, Barack Obama’s disdain for Netanyahu is becoming increasingly obvious! I get the feeling that Netanyahu’s upcoming electoral triumph may prove to be something of a Pyrrhic victory. Saudi Arabia will give the Palestinian government $100 million to help with a budget crisis. Saudi Arabia will give the Palestinian government in the West Bank $100 million, Reuters reported. The donation comes as President Mahmoud Abbas has asked Arab countries for a $100 monthly “safety net.” He promptly thanked Saudi Arabia, a longtime benefactor. Abbas has been asking for the money since December, when the Israeli government decided to seize more than $120 million in tax revenues it collects on behalf of the Palestinian Authority, the Guardian reported. “The state’s budget is facing a large deficit as a result of the docking of Palestinian money by the Israeli government as a punitive step after the UN recognition of Palestine as an observer state,” Abbas said in a statement. Palestinian Prime Minister Salam Fayyad told reporters last week his government could not pay the salaries of most government employees, the Times of Israel reported. He warned that more than 1.5 million Palestinians could be pushed into poverty. Other Arab states had also pledged to give $100 million to Palestine recently but have failed to follow through. Tags: israel and palestine, israel and palestine conflict, Netanyahu, saudi arabia, UAE. Filed under Israel and Palestine, israel and palestine articles, israel and palestine conflict, map of israel and palestine by Father Dave on Jan 18th, 2013. Comment. Non-violent Palestinian protesters brutalised – a turning point in the struggle? Could the crisis at Bab al-Shams be the turning-point in the Palestinian struggle for justice? Despite international opposition, Israeli Prime Minister Benjamin Netanyahu has vowed that he will push ahead with more colonialist expansion into the West Bank – the latest act of aggression being the planned ‘E1’ settlement. This time though, instead of trying to protest through the courts or simply waiting for the inevitable to happen, Palestinian activists took the initiative and created their own ‘fact on the ground’ – a tent-city settlement of their own in one of the Palestinian areas slated for Israeli settlement construction! The important thing to realise about the Palestinian ‘settlement’, in contrast with the coming Israelis-only settlement, is that the former is entirely legal. The Palestinians are building on privately-owned Palestinian land with the permission of the owner. Even so, the Israeli courts somehow ruled in favour of the Israeli settlers, and ordered the Palestinian protesters and their international partners to be removed from their land! I have often said that there are three levels of racism that can infect a community. The first is where racism happens but is not officially tolerated nor accepted by the broader culture. The second level is where racism is culturally acceptable, even if officially frowned upon. The third and most terrible level is where racism receives official sanctioning from the courts and government. Nazi Germany is probably the most horrible example of this third and final form of a racist state, but if Israeli courts are now so blatantly backing the eviction of Palestinian people from their own land, they are surely on the same terrible path! Israel mustered 500 armed troops to disperse the Palestinian protesters. As you’ll see from the video, the Palestinians kept to the classic protocols of non-violent resistance. Even so, many of them were brutalised. It is possible that this valiant act of non-violent resistance could play the same role in the Palestinian struggle as did the ‘Bloody Sunday’ incident of 1965 for the Civil Rights Movement in the US. Can the world really watch this sort of injustice take place and simply say nothing? Whether this particular act of violence will be the turning point or not, the testimony of Mustafa Barghouthi (recorded below) – that this will be the first of many such non-violent actions – is telling indeed! The Palestinians are tired of waiting for the rest of the world to take action. They have taken the future into their own hands! Tags: israel and palestine, israel and palestine conflict, Netanyahu, settlement construction. Filed under Israel and Palestine, israel and palestine articles, israel and palestine conflict, map of israel and palestine by Father Dave on Jan 16th, 2013. Comment. Britain spearheading new talks between Palestinians and Israel! Father Roy writes: France has joined Britain in spearheading this proposal. According to the EU’s Foreign Policy Chief, Baroness Ashton, the proposal could soon become a pan-European initiative. Please note the next-to-last paragraph in particular (highlighted). Preparing the way for Obama? The Zionist regime’s aggressive approach towards the Palestinians following the recognition of Palestine by the international community has prompted the UK and its allies to plan a new proposal to re-launch the so-called Middle East peace process. The new peace proposal for the Middle East being spearheaded by Britain and France requires Zionist regime’s authorities to resolve the conflict with the Palestinians within a year, the Daily Telegraph reported. The initiative is expected to be tabled by March following the formation of a new Israeli cabinet after next week’s general election [in the occupied Palestinian territories], according to the report. The proposal, which will include a provision for a Palestinian state with its capital in east Jerusalem (al-Quds), could eventually be adopted as a pan-European initiative by the EU’s foreign policy chief, Baroness Ashton, the newspaper reported. “We do know that the EU is planning to come up with something after the elections, when the new government has been formed,” one Israeli source told the Daily Telegraph. It (the proposal) will reportedly suggest negotiations between Israel and the Palestinians based on pre-1967 borders with appropriate land swaps, including the establishment of a Palestinian state with East Jerusalem (al-Quds) as its capital and will also involve an Israeli settlement freeze, the report said. William Hague, the Foreign Secretary, has told the House of Commons that he was consulting with his French and German counterparts about how to lend European weight to a US-led peace initiative. This comes as all past initiatives, proposed by the UK, US or other European states led to nowhere because of the Zionist regime’s expansionist policies and its continuation of building settlements inside the already occupied Palestinian territories. Tags: east jerusalem, father roy, israel and palestine conflict. Filed under israel and palestine articles, israel and palestine conflict, map of israel and palestine by Father Dave on Jan 15th, 2013. Comment. More Palestinians violently evicted from their land! It needs to be noted, not only that these sorts of criminal acts go on all the time but that they take place with the blessing of the Israeli court during times of so-called peace! One can only imagine if the Palestinian police attempted some sort of reciprocal act – trying, for example, to evict Israeli settlers from their colonial outposts in the West Bank. It would be interpreted as a provocation to war! Although established on privately owned Palestinian lands, Israel forcefully expelled residents of the village in a pre-dawn raid this morning. Six required medical attention. Shortly before 3 am, hundreds of Israeli policemen and soldiers staged a raid on the newly founded Palestinian village of Bab Alshams (Gate of the Sun), violently evicting its 150 inhabitants. Use of police brutality is even more objectionable in light of the passive resistance offered by the residents. No arrests were made, and all persons detained were released shortly after. In light of harsh international criticism over the plan to expand the Ma’aleh Edomim settlement, and in an attempt to draw away attention from the case, eviction took place early this morning. Following its arrival at the scene, a massive police force began by removing journalists from the residents’ immediate surroundings and proceeded to drag people away, beating some of them. Six Palestinians later required medical care at the Ramallah Hospital. Tags: israel and palestine, israel and palestine conflict, West Bank. Filed under Israel and Palestine, israel and palestine articles, israel and palestine conflict, map of israel and palestine by Father Dave on Jan 15th, 2013. Comment.